October is Pregnancy and Infant Loss Awareness Month. And I always try to write a little something about that. Why do I write every year? Because every day, more and more women experience this loss, and I know that in the early days after my own miscarriage, I was desperate for information and desperate to know I wasn’t alone. I never considered myself a candidate for a miscarriage. I was incredibly misinformed, and I had already had one normal, healthy pregnancy. I think it’s fairly common for women to not know it’s a possibility, and also to think that it’s rare and that no one wants to hear about it or talk about it. So, I write. I write to let women know that you’re not alone. You’re not responsible for what happened. And there are those of us out there that are glad to listen and willing to talk. And also to let you know that you are free to grieve for as long as you need, and that no matter what happens, you will never forget the baby you lost. My miscarriage was over 5 years ago now, and I still think about that baby every single day. This is normal, and totally fine. But also, you will learn to move on, to put the loss behind you and live life again. Take time out of your day today, or any day, and think of your friends who have gone through a loss. Give them an extra hug. And send your most positive vibes out for those women you don’t necessarily know, and those who suffer silently. October is Pregnancy and Infant Loss Awareness Month. A time I like to write a little something, because, if you did not know, I myself suffered a miscarriage in April 2011. Every year when the date passes, or when we reach this month, I am always shocked at how much time has passed yet how sad it still makes me feel. There’s a saying that there are some things you never, ever get over, you just get past them and find a new normal. And the death of a child, at whatever stage in their life, is certainly one of those things. I like to write and talk about my miscarriage, not to make people sad or to hold my own pity party, but to bring awareness. When I had my miscarriage, I was so misinformed and ignorant about the whole thing. I wish I had been more aware of the possibility. I wish I had known how very many other women suffered the same thing. I wish I had known how valid my feelings of sadness, loss and anger were. So, I write and I talk, so that other women won’t feel the way that I did. I encourage you, too, to open up and talk about your experience. You could make a real difference for a woman suffering in silence. And let’s remember our children that are gone, and never forget them, keep them in our hearts always. I still think about the baby I miscarried. Every day. Some days, just a fleeting thought. Other days, I cry a little bit about it. It’s hard to believe it’s been 2 1/2 years, because sometimes it can still feel like it just happened. In the days shortly after, I thought that if I could just get pregnant again, I could forget all about it and move on. Nine months later I finally got pregnant with Ferris, and I did not forget all about it, and did not move on. Quite the opposite, actually. Not only was I fraught with worry for the ENTIRE pregnancy that something would go horribly wrong, but I also felt so guilty for being so happy to be pregnant again. That maybe at some point I actually would forget the baby I miscarried. Then I thought when I just had the healthy baby boy in my arms, it would help me stop being sad at least. But then, Ferris arrived, and nope. I didn’t stop being sad. Of course I was, and am now, a lot less sad than I had been before, but there’s still a little bit of hurt that lingers. 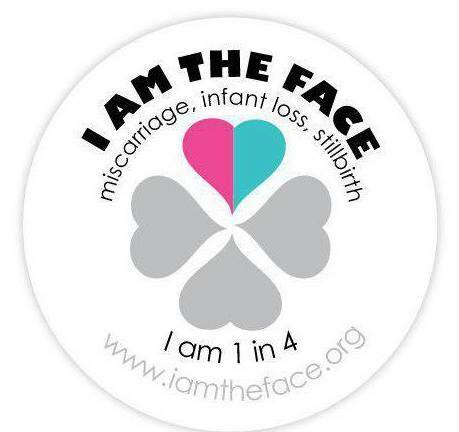 Today is Pregnancy & Infant Loss Awareness Day. Looking back, the one thing I wish more than anything else (aside from not miscarrying to begin with) was that I had been exactly that: more aware. I was completely clueless. And wrote on my blog at just 7 weeks that I was pregnant. So my loss was fairly public. Which was good in some ways, not so good in other ways. Miscarriage is something that just isn’t talked about, and I can’t for the life of me figure out why. It happens to so many women. It happens to one in four pregnancies. ONE IN FOUR! So why are we keeping ourselves so in the dark about it? Of course I knew it was a possibility. I had heard about it, knew a little bit about it. But I so naively thought it was something that only happened to women with fertility issues. I can’t believe I thought that! And I’d been pregnant and had Bowie, no issues at all, so I thought I was in the clear. I can just get pregnant again, nothing to worry about at all. But, something we can do is come together on Pregnancy & Infant Loss Awareness Day, share our stories, and hope that we can simply bring a little comfort to a woman who miscarries tomorrow, next week, next year. Help her feel a little warmth in her coldest hour, knowing that she’s not alone. And it’s not her fault. And she can grieve in whatever way, and for however long, she needs to. Because the pain can linger for a long, long time. And there’s nothing worse than dealing with that kind of pain, and thinking you’re alone. You’re not alone. We’re here. All of us. You will get through, and you’ll be ok. It has been one year since my miscarriage. One year ago Saturday that I found out the baby had passed away. And one year ago today that I finally got the courage to take the medicine that helped me pass the tissue. I don’t know when the moment was that the baby’s heart had stopped beating. I often wonder about that moment. Where was I? What was I doing? Did I feel anything different in that moment? It makes me feel strange knowing that in the two weeks between the baby’s approximate passing and the day I found out, I was still telling new people about the pregnancy. I just feel like somehow, on some level, I should have known. I know in my right mind, a whole year of recovery later, that it’s silly for me to feel that way. That there’s almost no way I could have known. That I should not feel so foolish for wanting to spread the joy of our pregnancy so early on. Yet in my heart, I still feel all of these things. I am still grieving today, something I wasn’t expecting. I mean, I knew it would take some time, but I figured being pregnant again would take a lot of the sting out of it. Surprisingly, not so. I have a new baby on the way, almost halfway through its gestation already, and yet I still spend hours thinking about the baby I lost, and grieving for that lost little soul. I don’t want to discourage any other survivors reading this post. I do feel so much better and more whole than I did a year ago. LIGHTYEARS ahead of where I was. But I am still grieving. Grief is one of the most complicated emotions humans have, I think. I’ve lost people before, people I knew well and loved, but this was something different. In addition to grieving the death of the baby, I think I was also in mourning for the loss of opportunity to get to know that baby as my child. I will never know if it was a boy or girl, introvert or extrovert, what their likes and dislikes would be, what their talents would be, who their friends would be. I get to experience all of that with the new baby, but I will always wonder about that little soul I never got to meet. It’s all still so fresh in my mind, it’s hard to believe an entire year has gone by. I want to thank you all from the bottom of my heart for being there for me this past year. For all of your condolences and words of encouragement. I needed them so much, and I can’t tell you how very much they meant to me. Here’s the questionnaire I usually do for New Year’s but just didn’t feel like doing it this year. I figured it works for birthdays too? I think I’m totally ok with turning a year older for the first time since turning 29. 1. What did you this year that you’d never done before? Hmmm…tough one right out of the gate. It was a rough year. I had a miscarriage, battled depression, found out I have a zillion awesome Internet besties and then I got pregnant again. And unfortunately, anything new I did outside of that sphere has just plain escaped my memory. I’m hoping for a much better, more memorable year. OH! And I took a glass blowing class. Which was such hard work, but also so amazing. I haven’t challenged myself like that in years. It’s a lot of taxing, physical work, so I will have to put it on hold for a bit, but will likely continue later. I don’t remember what I resolved to do last year. We were trying to get pregnant last January, so I suppose having a baby was tops on that list. Also, getting more involved in preschool, which I did. We kept up with dentist appointments, which is a big deal for us. I think I also semi-resolved to lose weight, but stayed pretty much the same. I didn’t make resolutions this year, I think I’m giving them up. They tend to put a lot of undue pressure on people. I say just try to do your best and be at your best 365 days a year. Not anyone else this year. Thank goodness, I don’t know if I could have handled it. A lot of people I know experienced a loss though, and I want to let them all know I’m very sorry and I hope they’re healing. 4. What would you like to have in 2012 that you lacked in 2011? A happy, healthy baby. More money in savings. A trip to see family members in the Midwest that I haven’t seen in a while. A better sense of purpose. 5. What dates from 2011 will remain etched upon your memory, and why? The miscarriage, obviously. And Thanksgiving and Christmas. They were both so wonderful this year, and gave me a much-needed something else to focus on. Honestly? Just surviving. There were a lot of days I truly thought I wouldn’t. I’m proud of myself for finding the strength to pick up and move forward. I moved slowly, but I moved forward. Losing myself. I just didn’t know who I was going to be or what I was going to do. I really let it all go. Now I’m trying to figure it all out again. I have just changed so much. Which really isn’t a failure in and of itself, but the way I just let things fall apart is. I’m thankful for the love and support I had from family and friends to hold it together in the small ways I still could. Depression. Which is a beast. And it’s real, very, very real. Don’t ever belittle someone for it, we all fight our own battles and you have no idea how hard someone else has it. My iPad. God, I love that thing, haha. Rent, preschool tuition, food, travel. The holidays. As I said, they were such a bright light in my (at the time) very dark world. It was so uplifting to see family, and celebrate. Also, our trip to Hawaii. We always have such an amazing time. 12. What song will always remind you of 2011? I have no idea. I don’t really listen to popular music. Probably something by Fitz and the Tantrums, they are my new ob-sesh. a) I am as happy as I was last year at this time, but a little more muted. I was still pregnant on my birthday last year, and I was completely blissed out. I am really very happy again this year, just a little more cautiously. Which I really wish I wasn’t, but I can’t help it. b) About the same. But about to get fatter! c) Same. We’re working on paying off my student loans, and working on saving. We’re not rich, just comfortable. And I’m ok with that. Living in the moment. I was so fixated on my future and getting pregnant again, I missed out on a lot. I even knew back then that I was missing out, and still couldn’t get myself to focus on the time at hand. One of these days I hope the clouds clear away and I can remember more of 2011. Beating myself up. I was pretty vocal about my pregnancy from just 7 weeks, and I was really hard on myself for that. I think I just felt humiliated. And I don’t enjoy pity, which I kind of felt from people (but now I don’t think they pitied me, they just felt bad and wanted to help). I also spent a lot of time wondering why I should be so sad, when other women have had it a lot worse than me. But the truth is, we all have to grieve until the pain is gone, no matter how “big” or how “small” our sadness is. At home, sitting around a fire in our PJs, watching Bowie play with his new Hot Wheels track and tons of new cars. It was a simple one, but perfect. This year I started watching Mad Men from the beginning on Netflix and I am COMPLETELY OBSESSED. I love that show to bits. And guess what? Season 5 starts tonight. Happy birthday to me. 18. What did you do on your birthday, and how old are you? I’m 33 this year. Over 30, but not 35 yet, haha. Here’s to the next year of my life! Every Thanksgiving, in both families, we all go around and say something we are thankful for. My responses are usually inane, thought of on the spot, and not really all that heartfelt. I’m thankful I didn’t get that cold Bowie had last week. I’m thankful our plane travel went smoothly. I’m thankful I get to eat this yummy food. But this Thanksgiving season, I find myself thankful for things in a way I never have been before in my life. For starters, we’re able to travel to Wisconsin this year, the first time in two years, for Thanksgiving festivities, which are a pretty big deal in both families. It’s always a hassle to travel that week, and quite expensive. Add a small child to the mix…it’s enough for even the most seasoned traveler to say, “forget it.” But, once we are there, it’s fantastic to see loved ones, stuff our faces with grub and feel the cold weather on our cheeks again, just so we remember why we love California so much. And, I’m still really bummed about my miscarriage after all this time. I’m getting to the point where a negative pregnancy test doesn’t send me into fits of misery for days on end, but I truly thought I’d be pregnant by the time my would-be due date rolled around (Nov. 19). And, since I’m not, it stings just that much more this month. But, now that the day has passed, I feel kind of relieved too. I woke up on the 20th and thought, “Well, I survived.” It might seem strange that I feel that way, but it is significant that the time I would have been pregnant has now passed. It’s like I’m through the thickest part. Not over it by a long shot, but through the worst of it. I’m thankful to have just a bit of weight off my shoulders. I’m also at the point in this whole experience where I am just so grateful that I have Bowie. There were a handful of people that, upon hearing about my miscarriage, would say, “Well, at least you have Bowie!” Which at the time I thought was a little insensitive. I mean, yes, I do have an awesome kid already. But, I still lost something. And that’s to be acknowledged. But after a while I kind of got the gist of what they meant. He truly and wholly has been my warm sunshine in this cold, grey world. Without him, I’m uncertain I’d have survived this ordeal. And I mean that literally. There are days I’d have only climbed out from under the covers to refill my wine glass and grab more chocolate if I didn’t have that sweet boy depending on me. So, for that, I’m eternally grateful. Any siblings he has or does not have in the future, I will never forget how his bright, smiling face made me feel during this time. I’ve also been watching friends go through some major relationship turmoil this past year. I made an attempt to joke about it on Twitter, saying something to the effect of, “I guess we’re at the age when our friends are all getting divorced.” But, I got a zillion responses from other people who have this happening too, and it’s really not funny at all. Just so sad, and one of those situations where you’d step in and do anything and everything you could to help, but there’s really nothing you can do. Huz and I have our moments, and the difficulties we’ve been through lately have been rough. But, we still love each other, when it comes down to it. And I’m very grateful to have him a part of my life, someone to cling to when the world is threatening to blow me down. I’m also guilty of not being so grateful each and every day that I have the luxury of being a stay-at-home mother, and that we get to live in a nice house in a super cool city. There are so many people suffering right now at the hands of our crappy economy, and we’ve tightened the purse strings, and have put off large purchase (i.e. house) plans for a while, but we can’t forget how fortunate we really are. Yes, this year I think I finally understand true gratitude. Maybe that means I finally grew up? I’m currently trying to conceive after having miscarried my second baby in April. I thought when I got my period again, and we could start trying again, that it would make me feel better about everything. But, it’s so stressful and frustrating and infuriating, it’s just brought on a whole new set of negative emotions. And I have become obsessed with MY CYCLE. And AM I OVULATING? And WAS THAT A PERIOD? SPOTTING? IMPLANTATION? (Because my body is a whole effing lot different than it was before.) Are those pregnancy symptoms? Or am I just getting another period? Do my breasts hurt? My breasts kind of hurt. But do they really hurt? Is that first-trimester fatigue? Or am I just tired? Is that nausea? Or nerves? Or am I just CRAZY? This stuff swirls around in my brain all day long some days. If you could hear my internal monologue, I know I would annoy the crap out of you, because I am seriously annoying the hell out of myself. I find myself measuring time in how dark the line on the ovulation test was. Life is a series of 28 day increments. 28 days to “get it right” or just start over from scratch. My heart goes out to anyone suffering from infertility. I don’t know how much I could bear, honestly. The most frustrating part is that I ALREADY WAS pregnant. That ALREADY HAPPENED. And then it ended abruptly, and I’m right back where I started. It makes me want to put my fist through a wall. And the undue stress that this whole experience has put upon my marriage? Well, let’s just say…it doesn’t make for a whole lot of romance. I hope this gets easier. As easy as it was before. But something tells me it will never, ever be like it was before. People keep telling me, “It will happen, it will!” But I can’t get rid of the nagging little voice in my head that keeps saying, “What if it doesn’t?” I want to fast forward like, 6 months or so, just to see how things are going. To see if this really is going to happen for us. And to skip all of this frustration and waiting.